Makenna Lee lives in Texas with her real-life hero of over twenty years and their two sons. As a child, she spent time in the woods looking for fairies under toadstools, making mud pies, and reading Little House on the Prairie. Her writing journey began when she mentioned all the stories in her head, and her husband asked why she wasn’t writing them down. The next day she bought a laptop and started her first book. She enjoys renaissance festivals, studying herbal medicine, researching ancestry, and usually listens to Celtic music while writing. She hopes to visit Scotland and someday live in a historic home in the Texas Hill Country. Makenna’s wish is to write stories that touch your heart and mind, making you feel, think, and dream. Explore the most romantic city in the Lone Star State through 17 incredible stories created exclusively for this anthology. 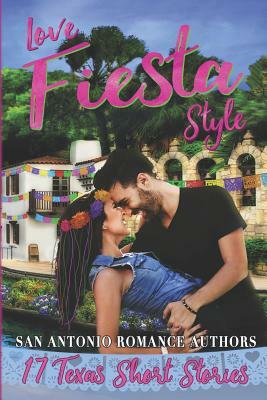 Love Fiesta Style features a mermaid at a majestic coronation, college sweethearts reuniting at a war widows’ ball, a cowboy spying his dream woman at an art show, friends igniting into lovers over a night-time parade, a spirit playing matchmaker for a chef and his customer, plus much more. Whether you like your romances mild, medium, or hot, the San Antonio Romance Authors have you covered.